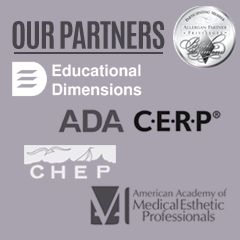 The Esthetic Skin Institute, a highly accredited resource for medical aesthetics training and certification for medical professionals, owes its success to its founder’s unique combination of skills and experience. Working as a registered nurse in Florida in the 1990s, Sasha Parker discovered that she also had a keen interest in skin care and holistic health. “I had a friend who was working as an esthetician,” she explains, “and she was so happy working with healthy, appreciative clients. She was also doing very well.” So Parker obtained licenses both as an esthetician and as an electrologist and started to establish a skin care practice. Soon she was working in both fields with a goal of eventually phasing out of nursing and working full time as a skincare specialist. Her plans changed however after an encounter with a physician at the facility where she worked. Observing his high degree of stress and fatigue, she suggested that he consider incorporating skin care into his practice, explaining the advantages and benefits of doing so. At the time, the concept of aesthetic medicine was so new that the MD was uncertain and declined. Later, after attending one of her educational presentations, he invited her to meet with him and his partner. Convinced of the potential for enhancing his practice with aesthetics, he invited her to join them. That was the beginning of the Esthetics Skin Institute. As time passed and the medical aesthetics field developed, more and more doctors and nurses contracted with Parker for training. Because she was a gifted and passionate educator, training soon eclipsed all of her other activities and in 1997 she established the Institute. Another indication of the quality of her service is the caliber of physicians who comprise her board of advisers. “Such highly respected physicians do not become affiliated with an organization that is not high quality,” she observes.